Yana has a wonderful family; a husband and two children. She received her degree from a Medical College. Her diploma qualified her as a medical assistant, and as a cosmetic and massage therapist. She has a second education at the Pedagogical University. Her degree is in biology. Yana teaches the fundamentals of ecology. She currently works as a massage therapist in the Transition Home in Marganets. Her husband works for the Marganets mining company. They have two children, a son and a daughter. 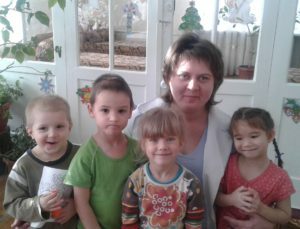 She started giving massage therapy to the MUCH children at the Marganets Transition Home in January 2017. Сhildren feel her special love for them and respond to her love with all their heart. Yana resigned her position in September 2018. Her contributions in beginning the massage therapy program at the Transition Home are greatly appreciated.